The Great Salt Lake of northern Utah is a remnant of glacial Lake Bonneville that extended over much of present-day western Utah and into the neighboring states of Nevada and Idaho approximately 32,000 to 14,000 years ago. During this time, the peaks of adjacent ranges such as the Promontory and Lakeside Mountains were most likely islands. As climate warmed and precipitation decreased in the region, glaciers that fed meltwater to Lake Bonneville disappeared, and the lake began to dry up. 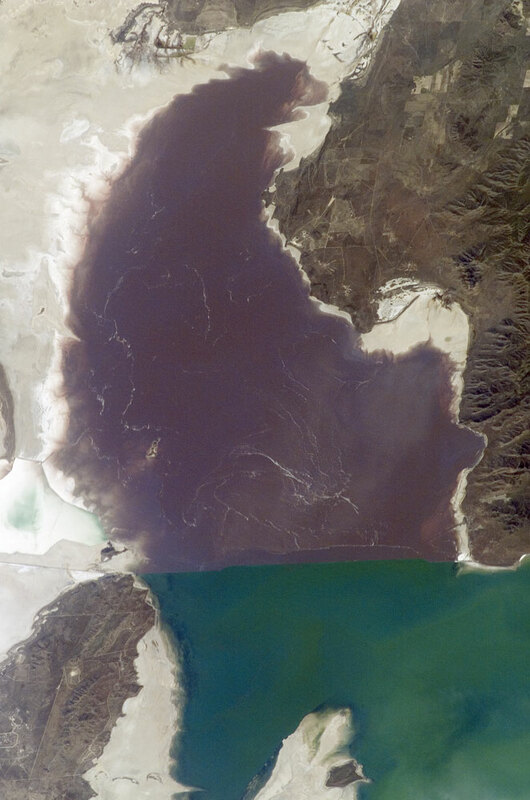 The present-day Great Salt Lake is a terminal lake in that water does not flow out of the lake basin. Water loss through the year is due primarily to evaporation, and when this loss exceeds input of water from rivers, streams, precipitation, and groundwater, the lake level decreases. This is particularly evident during droughts. Evaporation and the relatively shallow water levels (maximum lake depth is around 33 feet), has led to increased salinity (dissolved salt content). The north arm of the lake, displayed in this astronaut photograph from April 30, 2007, typically has twice the salinity of the rest of the lake due to impoundment of water by a railroad causeway that crosses the lake from east to west. The causeway restricts water flow, and the separation has led to a striking division in the types of algae and bacteria found in the north and south arms of the lake. North of the causeway, the red algae Dunaliella salina and the bacterial species Halobacterium produce a pronounced reddish cast to the water, whereas south of the causeway, the water color is dominated by green algae such as Dunaliella viridis. 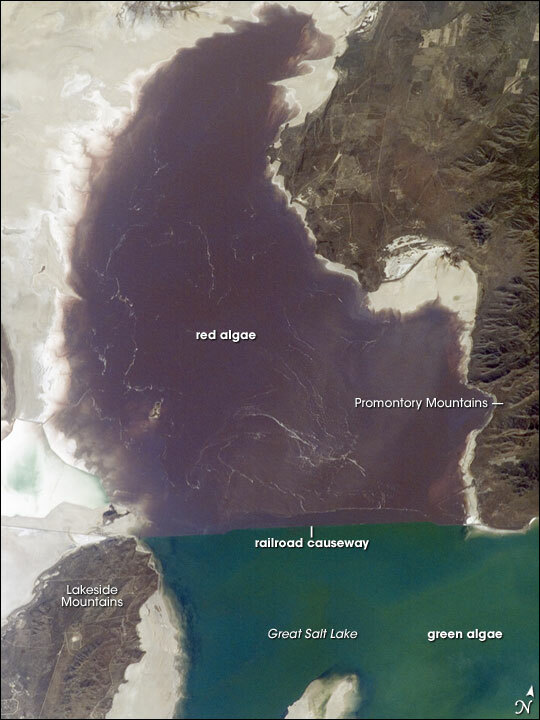 The Great Salt Lake also supports brine shrimp and brine flies; and it is a major stopover point for migratory birds including avocets, stilts, and plovers. Featured astronaut photograph ISS015-E-5815 was acquired April 30, 2007, with a Kodak 760C digital camera using an 180 mm lens, and is provided by the ISS Crew Earth Observations experiment and the Image Science & Analysis Laboratory, Johnson Space Center. The image in this article has been cropped and enhanced to improve contrast. The International Space Station Program supports the laboratory to help astronauts take pictures of Earth that will be of the greatest value to scientists and the public, and to make those images freely available on the Internet. Additional images taken by astronauts and cosmonauts can be viewed at the NASA/JSC Gateway to Astronaut Photography of Earth. 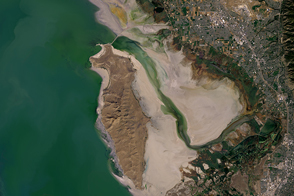 The Great Salt Lake of northern Utah is a remnant of glacial Lake Bonneville that extended over much of present-day western Utah and into the neighboring states of Nevada and Idaho approximately 32,000 to 14,000 years ago. The north arm of the lake, displayed in this astronaut photograph from April 30, 2007, typically has twice the salinity of the rest of the lake due to impoundment of water by a railroad causeway that crosses the lake from east to west. The causeway restricts water flow, and the separation has led to a striking division in the types of algae and bacteria found in the north and south arms of the lake.